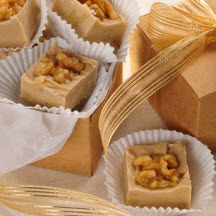 Sweet, smooth and scrumptious, you'll love this mouth-watering recipe for maple walnut fudge. Stir in marshmallows, morsels, nuts and maple flavoring. Stir vigorously for 1 minute or until marshmallows are melted. Pour into prepared baking pan. On top of fudge, place nut halves in rows spacing about 1/2 inch apart. Press into fudge; refrigerate until firm. Cut into 48 squares with 1 nut half per square.